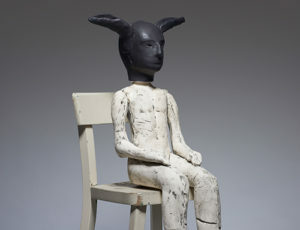 Christie Brown came to prominence in the mid-1980s, in the vanguard of a new generation of figurative ceramic artists in the UK, whose work challenged the era’s primary focus on the vessel form. 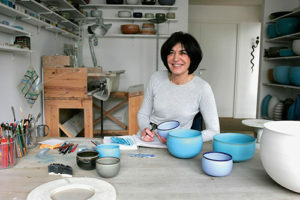 After taking a General Arts degree she worked as a TV researcher before re-thinking her career path in the early 80s via further studies on the Studio Pottery Course at Harrow College of Art. Initially known as a maker of graceful bas-relief figures, by the mid-90s her work had became fully three-dimensional and her representations of the human form had taken on a more disquieting, haunting presence. Over the course of her career Brown has explored a variety of themes, all underpinned by a range of enduring concerns, notably the relationships between historical artefacts, mythological narratives and contemporary experience. She employs a variety of materials and processes; however, for the past two decades the technique of press moulding has been central to her practice. Old World ceramic art and tile murals. She honed and perfected her craft and this style has been the mainstay of the artist’s work ever since. 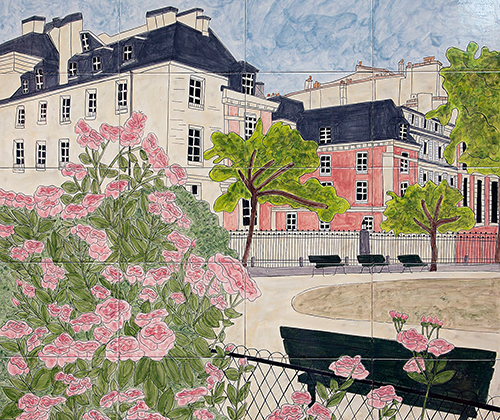 Of the influence of her European travels upon her art Virginia observes, „Europe’s tile murals, history, colour and architecture impacted my artwork and my art techniques immeasurably and from this my career in ceramic tile artwork was born“. Freedom has always been a guiding force for my work. Freedom is a direction to maintain with the pleasure, the love to create with clay as sole guide. 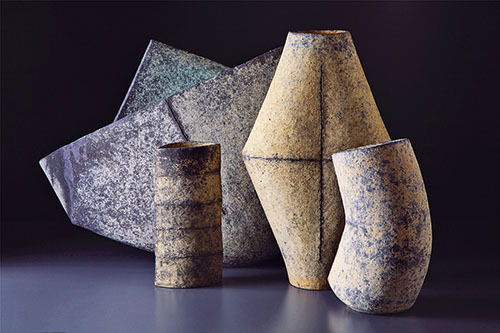 The first person who enabled me to feel this is RYOJI KOIE in Japan, 20 years ago already … I had the opportunity to be one of ten who participated in this first official visit of meetings between French potters and Japanese potters in 1995. This Japan, I had dreamed about … for such a long time, doubtless since my last life as a Japanese potter, as my Japanese ceramist friends say jokingly, so much my ties seem obvious and sensitive. It was thus the beginning of my journeys in Japan and then invitations to have exhibitions, to participate in workshops, to stay in residence, to live in Japan … After 2003, when I was invited to participate in the international workshop IWCAT, in 2005 I stayed six months in residence at Tokoname, working in a studio lent by the Art Nagoya University, which was supported by ceramic artists SUGIE JUNPEI and SHIBATA MASAAKI. Kenichi Harayama is a Japanese sculptor who creates non-objective artworks. As he says, he likes to create work that reflects the desire to “see what he has never seen.” He strives to deliberately form his work, rather than rely on process as a mode of expression. Beauty and human expression lie at the heart of his studio practice. Culture is what people make of themselves and their world. The age in which everyone could show what they were really made of is coming to a close. It is becoming more contemplative and asking what will happen next. Anyone who is concerned about the future of ceramics will not be unmoved by this question. science and philosophy, technology, economics, art and religion. In all of the arts, the pluralism that is typical of Modernism manifests itself (“anything goes”). The pluralism of Modernism leads to arbitrariness, to eclecticism, to a lack of endeavour to the danger of a crudely developed will to form. To the decline of the drive to create culture into arbitrariness. 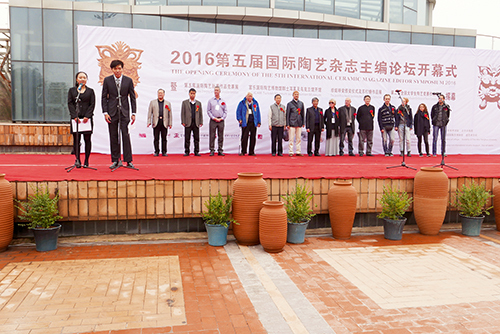 It is a remarkable event, even for Chinese standards. In 2001, there was the first international exchange on contemporary ceramics in Fuping with the Fuping Pottery Art Village. 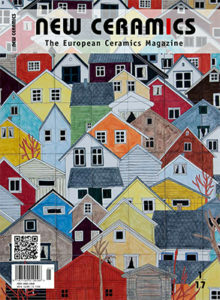 In 2003, as a consequence, construction work began on the International Ceramic Art Museum in Fuping, which was inaugurated in 2004, where simultaneously the first meeting of a group of publishers and editors-in-chief of international ceramics magazines took place, which in turn led to the founding of the International Ceramic Magazine Editors Association (ICMEA) and at thwich the first international competition for emerging ceramic artists was held. Since that time, the Pottery Art Village has been available for artists’ residencies. 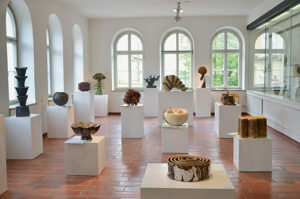 Galerie Handwerk, the gallery of the Chamber of Skilled Trades in Munich, has a reputation for its outstanding, rigorously curated exhibitions of contemporary craft. 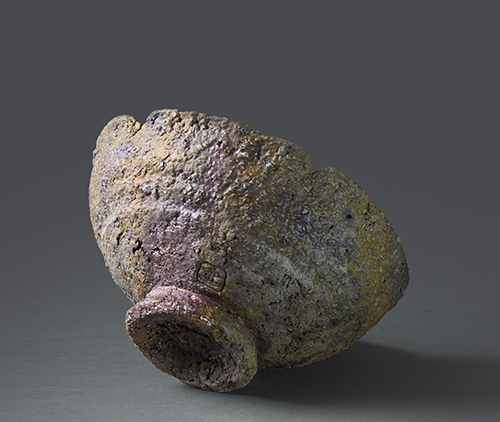 Visitors to this gallery are guaranteed to find exhibits from the crafts that represent the contemporary Zeitgeist or that provide them with a deeper insight into the historical dimension of this specific trade. 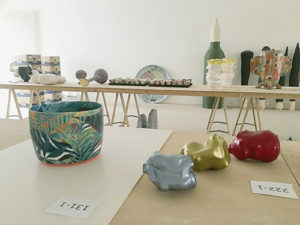 For a number of years now, Galerie Handwerk has devoted itself particularly to the theme of ceramics, and mainly in the spring, it presents exhibitions from this field of the crafts. In January and February, a major retrospective documents the history of the tradition-steeped Keramik-schule in Landshut, which has been in existence since 1873, when it was founded as the Königliche Töpferschule – the Royal School of Pottery. Sunshine, endless beaches and skyscrapers. Exciting nightlife, famous theme parks, glitz and glamour, behind it the rich green of the hinterland rainforest and the mountain ranges. Welcome to the Gold Coast, for thirty years home to the International Gold Coast Ceramic Awards. 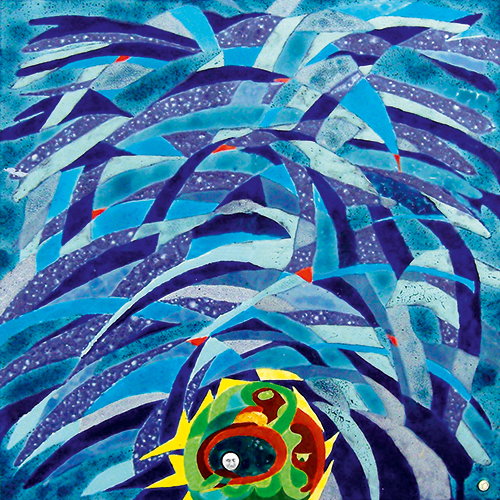 In 1982, the first exhibition was local, today it is international and takes place every two years. Ceramists from Australia and all over the world apply to take part in the competition for the juicy first prize of AU$ 10,000. From 250 applications, 51 participants were selected with nine pieces from overseas (1 NZ, 5 UK, 1 US, 1 South Korea and 1 Germany). 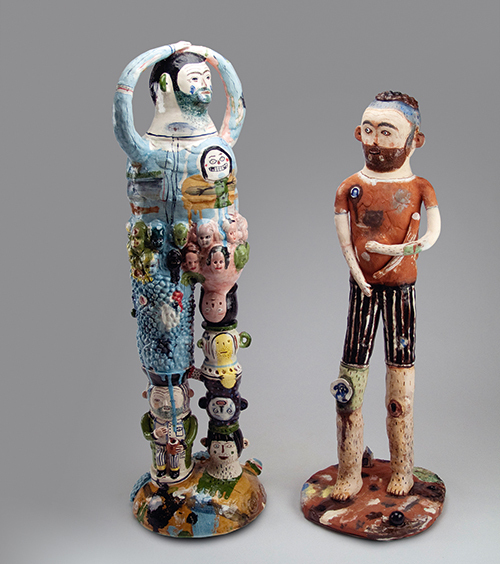 The Gold Coast City Art Gallery also has one of the largest ceramics collections in Australia. Alev Siesbye is a Danish citizen, living in Paris since 1984. Her work is beyond description. Every unique shape and colour reveals the richness and serenity of the universe. Mihara was born in Izumo, Shimane Prefecture, Japan, in 1958. A Japanese philosopher of the Nishida school once saw Ryoan-ji (Temple of the Dragon at Peace) and said, “In this garden, I found infinite tranquillity and fathomless depth”. 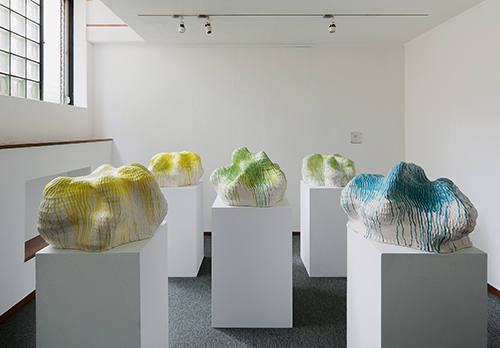 One looks at Ken Mihara’s work in the same mood and state of mind. 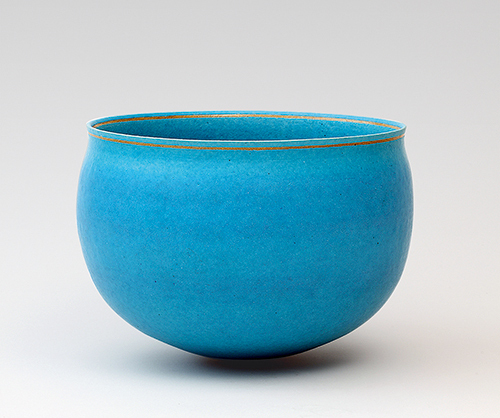 He introduces natural landscapes and the philosophy of Zen into his austere, serene, mysterious, and ethereal objects, of which the seemingly simple appearance contains one of the most meticulous treatments of twists on ceramic slabs, while infusing them with the profound colours of nature. 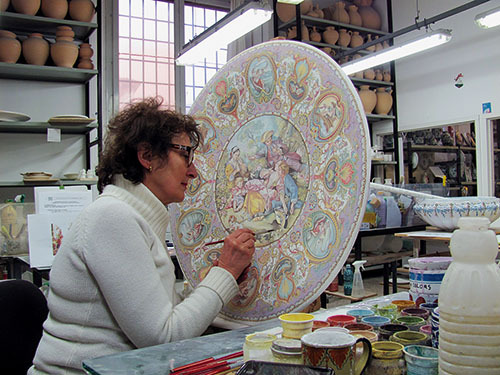 Together with her family, Laura is a specialist in the field of majolica. In addition, she lives and works in Italy’s most famous ceramics city, Faenza. She immediately agreed to let our readers in on some of the secrets of majolica.